No, 66 is not in San Francisco. I forgot to mention in my Monday blog that I am in Manhattan for the week. Work, mostly--though I do try to find time to go in search of a good meal. So far I have made it to 66 for dinner, Golden Unicorn for Dim Sum and Payard for tea. All these plus visiting 3 customers so far, not bad huh? I've got the Golden Unicorn recommendation from Chowhound and eGullet. I wasn't so impressed though. It was good, but nothing to write home about. Payard, on the other hand, was a stunning disappointment. I had high hopes for them, but I'm afraid to report that it wasn't even worth the trip up town. The Cannelles were too dry, and nothing close to any of Pascal Rico's boulangerie in San Francisco. The Tarte aux Fraises was tasty enough, though a bit soggy and the Pate Sucree crust way too thick. The tea, Payard's blend, was awfully over-brewed. The Pates des Fruits were disheveled looking. The macarons, oh I had such high hope for those macarons, were pretty but super sweet. I tried a few flavors, framboise, pistache, chocolat, and cafe. They were all extremely sweet. It appeared the biggest difference between each "flavor" was the color, not so much the taste! The framboise had a teeny amount of preserves in the middle, barely providing a tang, let alone enough to counter such monstrous sweetness. The chocolat tasted ever so slightly of chocolate, the same with the pistache. On top of all these, the patisserie itself appeared to need a good top to bottom scrubing. It was oppulently decorated yet managed to look on the whole deteriorated and disheveled, sort of like Miss Farversham's drawing room from Great Expectations. The only thing you wouldn't find chez Miss Faversham would be the Barry White's disco music blasting in the background! With all the horrid reviews I've heard and read about 66, I had to try it. I'm a long time fan of Vongeritchen. One of my parents' favorite restaurants was the Normandie Grill at the Oriental in Bangkok, where JG worked for a while. Though I could hardly believe anything Jean-George touched could've been that bad, I went to dinner tonight fully expecting not a very good meal. I just had to try it anyway. I was quite surprised to find the meal quite pleasant, though not much the dessert. We arrived a little late for our reservation at 6pm. The hostess greeted us politely, despite what I'd read in Vanity Fair. She only fumbled a bit after allowing me to pick a better table than the one she tried to seat us, only to come back 10 seconds after we sat down to tell us that we couldn't have the table because it had been "specifically requested" by a customer. Whatever. Only a few tables were occupied when we arrived, so I was a bit annoyed to be seated right next to a large bunch of very loud people. So the first impression of the place wasn't that good. Not helping the matter was the large group of grim face waiters and bus people congregating near the entry way. Most of them were wearing Mao-ish gray uniforms, adding to the somber mood of the place. The mood picked up a bit after our smiley and helpful waiter appeared at table. He was an artsy looking young Chinese boy with spiky hair and dark rimmed glasses. Having absolutely no idea what the portion size was like, I was quite appreciative when our waiter suggested that for two hungry people, we should consider ordering 2-3 things from the left side of the menu, and perhaps two more from the right. The amount would have been perfect had I listened and not picked an extra dish and ended up with more than we could handle. I navigated the menu carefully, trying my best to avoid anything that was too obviously gimmicky. I think I ended up with a pretty good list, especially after seeing some seriously dubious looking food served at the two tables next to me. One was this large piece of fish, which appeared to be pan fried and swimming in an orangish sauce. After the first bite of that my table neighbor creaked "sweet". Then there was a plate full of odd looking fried dough, complete with day-glo orange "barbeque" sauce. By the time I was done with my dessert my neigbours still hadn't touched them, so I couldn't report the reaction. Anyway, on to what I actually ate. We had squab a l'orange with caramelized tamarind and lacquered pork belly from the appetizer menu, Chinese e-mien stir fried noodle, asparagus/lotus/lily stir-fry, and braised short ribs with Muntow (steamed bun). The squab was brought to the table first, and the pork belly quickly followed. The squab was nice. The texture was perfect, the seasoning generally right, except for the one bite that hit me with such an overwhelming scent of five spice powder--the spice jar must have fallen on to that particular bit of the squab. I also had to say I didn't like to dressage on that plate much. The squab came buried in a pile of vaguely moldy smelling sprouts, with a couple pieces of "caramelized tamarind" on top. The "caramelized tamarind" turned out to be indistinguishable from tamarind candy you could buy at any Chinese market. I'm not accusing JG of using cheap candy in his nearly $20/plate appetizer, I was just saying that the taste was indistinguishable. The accompanying sauce on the squab, made of orange, oolong and ginger, was quite well balanced on the squab, but not over rice as suggested by our nice waiter who brought over a bowl of rice in a fit of trying to be too helpful. The pork belly on the other hand, was sublime. I have to confess I had a softspot for pork bellies, and this one did not let me down. The meat/fat proportion was perfect, the texture just toothy enough yet melted in your mouth. Though if I had a bone to pick here it woud be that the onion confit was much too sweet for the faint acidity on the pork belly to support. The two "side" dishes we ordered, the e-mien noodle and asparagus were quite pleasant. The seasoning of noodle dish was balance and the usual suspects of stir-fry vegetable ingredients (bell peppers, bean sprouts, celery, and onions) crunchy, with a pleasantly toasty scent of a well seasoned wok. Though I have to say I found the price to be quite steep for what it was, a simple stir-fry noodle. The asparagus was nice, though a bit plain. I did like to crunchiness of the lotus quite a bit though. The only dish we ordered from the entree list was the braised short ribs, which turned out the be the best of the bunch. The short ribs were perfectly seasoned, the texture soft and melting without being mushy. The dark brown gravy was complex and delicious. The miniature accompanying buns were cute, and tasted well in the sauce, though nothing to write home about. The disappointment of the evening has got to be the desserts. Despite some bad reviews, I went with the Pudding Trilogy anyway. I mean, how could anyone resist a dessert called the Pudding Trilogy?? Despite my love of Ovaltine, having grown up in Asia, I found the Ovaltine pudding sort of odd tasting. The texture, in particular, was quite bizarre, sort of between a well-executed pot au creme and an unevenly congealed jelly. It was disturbing really, though I did like the rice crispy thingy that was served on top. The mango pudding tasted only mildly of mango, while the raspberry pudding was an alarming shade of fuchsia. I liked neither of them more than the Ovaltine one. All in all, I found the meal to be nice enough. The dishes were obviously done with care and skills, though at times gimmicky and a tad oddly combined, yet one could still clearly see the skills and imagination of JG. Hopefully after working out some more kinks in the taste and the menu, the place would be a whole lot better and more deserving of the $140 we shelled out tonight for a dinner for two with two glasses of wine and one shared dessert. *I make my own, but you can easily buy it at any Asian Market. The most readily available brand is in a 16oz jar, with yellow top and yellow, red and white lable. The label says Chilli Paste with Soya Bean Oil. The brand is Pantainorasingh. I have used this brand in the past, and found it acceptable for cooking though not for eating plain. wait until the garlic is just beginning to fragrant, be carful not to let it brown at this time as it will continue to cook after the addition of other ingredients. Add the chicken, stir it around for a few minutes until the chicken is about half way done, then add the fish sauce and chilli paste, give it a good stir. Next add the onion and bell peppers. If you like it very spicy, smashed up a couple of bird-eye chilli and throw them in. Cook, stiring frequently, until the chicken is done. Check the seasonings, add more fish sauce if needed. Throw in the handful of Thai Basil, turn the heat off, stir a few times to incorporate the basil into the dish. Serve immediately with freshly cooked jasmine rice, from Thailand of course. Tofu: For the Tofu version, I use Chinese fried tofu that you can buy from most Asian markets. They are normally in square or triangle pieces in plastic bags. Just buy the freshest looking ones. If you are so inspired, you can quick fry them again before cooking, though it's not neccesary. I usually slice them thin and use in place of chicken. You need to add the tofu, onions, and bell peppers at the same time, as the tofu do not need very long to cook, and you want to end up with slightly crunchy onions and bell peppers, not raw. Shrimp: will do well here as well. For this I would use lemon basil in place of the regular thai basil if you could find them. The subtle tang of the Lemon Basil (Bai Mang-Luck in Thai) goes very well with seafood. If you find this recipe useful, please consider giving a few dollars to help my charity drive for Doctors without Borders by clicking on the picture below. 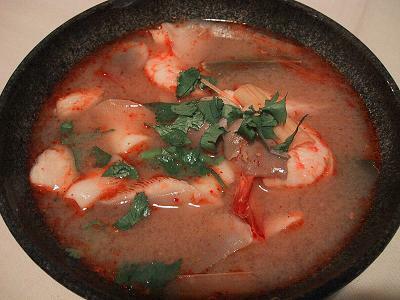 There are endless variations of how Tom Yum Goong is made in Thailand. This one is how my Aunt taught me. The soup is, of course, finished with her famous Nam-prik Pao. ½ kilo or 1 pound of shrimp, buy those with heads attached and has a red/orange fat visible inside the head. Shrimps: rinse, peel and devain the shrimps, reserve the shells and heads. Squeeze the fat out from the heads and reserve in a separate bowl. Heat the shells, heads, in a pot with the water. Bruise the kaffir lime leaves and smash the lemongrass and galangal a bit and throw them into the pot. (Reserve a few lime leaves, a slice or two of galangal, and some lemon grass for the soup later) After the water come to a full boil, lower the heat to simmer and continue to cook for about 5 minutes. Strain, crush the shells and heads well to squeeze all the yummy taste from them. Heat the stock to a boil, add the shrimp, shrimp fat, mushrooms, and the rest of the lime leaves and lemongrass. When the shrimps are just done (take care not to overcook the shrimps), turn the heat off. Season with fish sauce, lime juice and Nam-prik Pao. If you like it hotter, smash up a few chillies and throw them in. The taste should be sour, salty, hot, with a slight sweetness at the end. Cover and set aside for later. 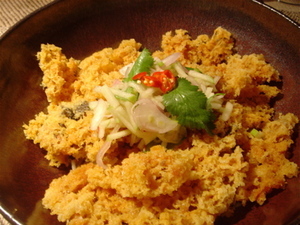 The Kao-tod should not be fried up too long before serving as they will become soggy. Pound the garlic into a fine paste. In a large bowl, use your hand to forcefully mash together the garlic, ground pork, pork skin, jasmine rice, and salt. Knead the mixture a bit to build up gluten which gives the Nam a nice structure. Roll the ingredients into about 10 equal size balls. Steam the Nam balls for about 10 minutes or until just cooked. Do not over-cook them as the salad will be dry. Make-ahead note: You can make both Kao-tod and Nam-sod up to one day ahead, follow the recipe to finish the salad before serving. First you fry up the Kao-tod. Pat the Kao-tod mixture into patties, each about 3 inch diameters and ¾ inch thick. Fry these in hot oil until golden brown. Set aside. Quickly fry the 10-15 dried chilli, only for 10-20 seconds or so, until crisp. Be careful not to let them turn too brown. In a large bowl, break up the Nam balls and mix in the lime juice and fish sauce. a) mix all the ingredients together, garnishing with the Kao-tod, fried chilli and slivers of lime. b) on a large plate, put the Nam-sod in the middle. Arrange the rest of the ingredients around the Nam-sod and let your guest mix their own salad at the table. This recipe looks daunting, but I promise it will be the best Massaman Curry you have ever tasted. Even if you opted for the canned paste rather thank using this recipe, the process of marinading and simmering of beef in coconut milk and the addition of spice during the cooking will improve the taste dramatically. Cut the beef into large chunks and marinade them in the coconut milk and julienned ginger. Set aside for at least 30 minutes before proceeding to the next step. Simmer the beef chunks in the marinade in for another half an hour. While the beef is simmering, pound or grind all the Masaman paste ingredients together until the paste resembles a fine puree. You can add a little water to the paste if it became too thick to be processed in a blender. Take care not to add too much water as the paste will create a nasty splash when cooked. Heat up half a large wok or sauteed pan with 2 tbsp oil, add the massaman paste and cook for a few minutes, stirring vigorously. Add a cup of the coconut cream in the pan and cook, stirring frequently, until the paste is completely dissolved into the coconut cream. Let the mixture bubble for a few minutes until a layer of oil begins to separate from the mixture. Add the rest of the coconut cream and let it bubbles away for another few minutes until the oil begins to separate again. Add the whole cardamoms, cardamom leaves, whole shallots, peanuts, palm sugar, tamarind water, and fish sauce. Mix the content of the two pot together, and continue to simmer until the beef is tender. Be careful not to let the curry boil too vigorously at this stage as the coconut cream will curdle. Just let the pot simmer gently until the beef is tender. Check the seasoning before turning of the stove. The taste should be spicy (not too hot, but very spicy), salty, sweet, with an ever so slightly sour aftertaste, in this order. Do not let it be cloyingly sweet. Serve with freshly steamed Thai jasmine rice, or Naan bread. *In Thailand, the first extraction with very little, if any, addition of water is called coconut cream (Hua Gati). This compares to sort of an extra virgin pressing of olive oil. The next extraction, with added water, is called coconut milk (Hang Gati). If you use canned coconut milk, just spooned off the thick "cream" part to separate from the milk. *The paste will have to be used the same day if there's any water added. Otherwise it will keep for a few days in the fridge. It does not, however, freeze well. I know the thought of pounding your own curry paste could be quite intimidating, however, there is no need for alarm. There is definitely an order to this seeming chaos. First, you will need an appropriate tool. 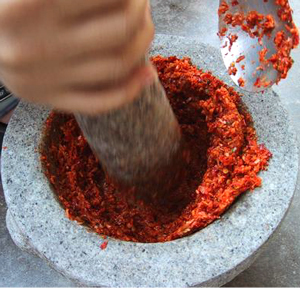 For this I suggest a good quality Thai mortar and pestle (Krok and Saak). I hope you know what I am talking about. Otherwise watch Jamie Oliver, his Krok is a constant presence on the countertop. You will need to "mise en place" all your ingredients. If your recipe calls for some ingredients to be roasted, do so. You can use your toaster oven or just dry roast in a pan. You should, however, roast the shrimp paste regardless of what the recipe says. Wrap it loosely in foil and roast in the toaster oven for about 5 minutes at 450F. Dried chillies are a main staple for all curry paste. Soak them in warm water for at least 15 minutes or until soft. Seed and chop them finely. While waiting for the chillies to soften, turn your attention to the other ingredients. Chop them as finely as you can. You can use your old workhorse Cuisinart for this, but don't chop all the ingredients together, do each separately. When the ingredients are prepared and ready, start your pounding. The first ingredients into your Krok are chillies and salt. Pound them until very fine, then add the harder stuff such as kaffir lime zest, cilantro roots, galangal, lemongrass, turmeric, or others. Pound them until fine, it will help if you do one at a time. Then add your garlic, again pound finely. The next ingredient is the shallots. After you're done pounding the shallot to a fine paste, the mixture in your Krok will be quite moist. This is the time to add powdered spices were they called for in the recipe. The last to go in should be the shrimp paste, since it is, as the name implies, already in paste form. Remember not to stare too closely while admiring the progress in your Krok, lest your eyes burn with excruciating pain from flying bits of the paste. If you are new at this, take a piece of paper or foil,cut a circle slightly larger than the diameter of your Krok, position the circle over your Saak or pestle and push gently downward. Your Saak should now be dressed with a homely little skirt. This will save your eyes from flying ingredients. After all the pounding, you should end up with a very lovely fine paste in your Krok ready to be turned into your own glorious curries. I have been so insanely busy I've completely neglected my blogs. Work is nuts, and I'm about to start my insane travel schedule again---so I thought if I didn't post now, I'd never get started again. En plus, boy do I have a story to tell. Last weekend I was inspired to make my aunt's famous Chilli Paste (Chilli Jam or Nam-prik Pao in Thai). It was my grandmother's recipe. I am addicted to that paste. I grew up on it. We always had a jar at home, and used it for practically everything. A dollop in a bowl of Tom Yum Goong, stir-fired with clams, spreaded on toast like a spicy jam, or simply mixed in with warm rice. It is black gold, I tell you. I remember vividly the scenes at my aunt's house every time she made a batch. There would be cars waiting, driven by our drivers and even some of my cousins, to dispatch the Nam-prik Pao as soon as it was done to friends' and relatives' houses as gifts. Anyway, I was missing it so much last weekend. My supply from Thailand ran out ages ago, and the commercially made stuff is crap to eat! So I decided to give it a try. A few years ago on a visit, my aunt taught me the family's secret recipe. We weighed everything so I had a recipe to start with, but she admonished me to not go by it alone. She had me taste every stage as she conjured her magic, and told me to memorize well. She didn't need to remind me to remember what the end product should taste like, as it was imprinted in one of my earliest taste memories. So I did it. I started early Saturday evening, and it was well into the early hours of Sunday morning before I was done. I definitely underestimated the time it took to slice about half a kilo, each, of shallots and garlic. My aunt insisted that they should be thinly sliced, by hand. It was easy for her to say. She had servants to do all the heavy slicing!! So there I was, obediently slicing shallots, one by one, until the whole half kilo was done. Then there was the garlic to do!! I persevered, not wanting to stray from the recipe the first time I made it. And when it was over, I had seven small jars of my aunt's Nam-prik Pao--exactly like how she made them. I was flabberghasted. I really didn't think I could do it. But I did! I was so happy I could cry. I was so happy I couldn't stop jumping around even though it was already well into the early morning. The next morning, Chris walked around my apartment sniffing the air. He kept saying—what was that smell? It actually took a day or two for the smell of fried garlic and shallots to go away finally. Chris's complaint went completely mum after Sunday night dinner. For which I made a few dishes with that magic Nam-prik Pao. 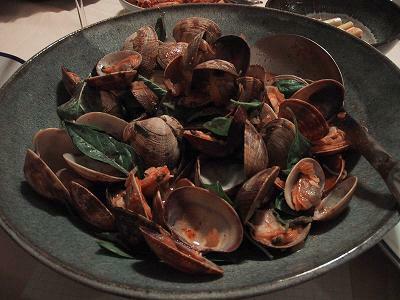 Clams stir-fried with Nam-prik Pao and Thai basil, Tom Yum Goong and Tofu stir-fried with Nam-prik Pao. The meal was delicious, everyone said so---even our little friend Sasha. Pim is a bit confused. She has, since long ago, taken up permanent residency in the borderlands. She plans never to leave. Her academic training straddles cognitive science, communications, and ethnomethodology, which, perhaps, explains why her Ph.D dissertation is a perpetual work in progress. She is an academic at heart, but is currently selling out by working for The Man, shamelessly pushing bandwidth sucking devices. She, most of the time, would rather be playing with food, books or working for peanuts at Amnesty. But hey, the girl's gotta pay for her food! She was raised in Bangkok, educated in other places, now lives in San Francisco, and works in the Geekdom that is the Valley. She spends half of her waking hours on planes crisscrossing the big pond, and ends up working, eating, cooking, and otherwise partying a great deal in London and Paris. Chez Pim is an occasional chronicle of her musings on food, moods, and other barely interesting things. She can often be reached at chezpim at gmail dot com.